The Bruins and Red Wings are set to kick things off Friday night at TD Garden as the two teams finally begin the 2013-14 Stanley Cup Playoffs. The now Atlantic Division rivals meet in the playoffs for the first time since 1957. The Red Wings won the season series against the Bruins 3-1, outscoring the Bruins 13-9, six of those 13 did come in one game. The Bruins enter the playoffs as the Presidents� Trophy winners. Detroit finds themselves in the playoffs for the 23rd consecutive season, this time as the Eastern Conference�s second wild card team. The Bruins held an optional morning skate this morning at TD Garden. With the exception of Daniel Paille, Chris Kelly (back) and Matt Bartkowski (undisclosed), everyone was accounted for. Paille (concussion) skated for the first time since his injury, but will not play in tonight�s game. Kelly and Bartkowski are questionable for tonight, although it looks like neither will be a go for tonight. Although he is not expected to play tonight either, Red Wings Captain Henrik Zetterberg skated with his team this morning, looking pretty good in the process. It is still unknown if Zetterberg will return at all in this series. When the playoffs roll around, a different David Krejci is unleashed. With 73 points in 81 career playoff games, it�s safe to say that the playoffs bring out the best in Krejci. The Krejci line was arguably the best trio in all of hockey this season and the Bruins will look for much of the same from Krejci and company as the Bruins look to avoid the first round upset. Krejci has developed into one of the most underrated centers in the game, his continuing chemistry with Milan Lucic and Jarome Iginla has been fun to watch. Look for Krejci to have himself a big night as he looks to help the Bruins jump out to an early series lead. Carrying the offensive duties for much of the regular season, Gustav Nyquist will be looked upon to do the same as the Red Wings kick off things in Boston Friday night. Nyquist will be playing in his 19th career playoff game Friday night, but his expectations are much higher this time around. En route to a Calder Cup title with the Red Wings' minor league affiliate, the Grand Rapids Griffins a season ago, Nyquist tallied seven points in 10 playoff games. With the lights much brighter and even more eyes on Nyquist, It will be interesting to see how the 24-year old Swede handles the pressure. 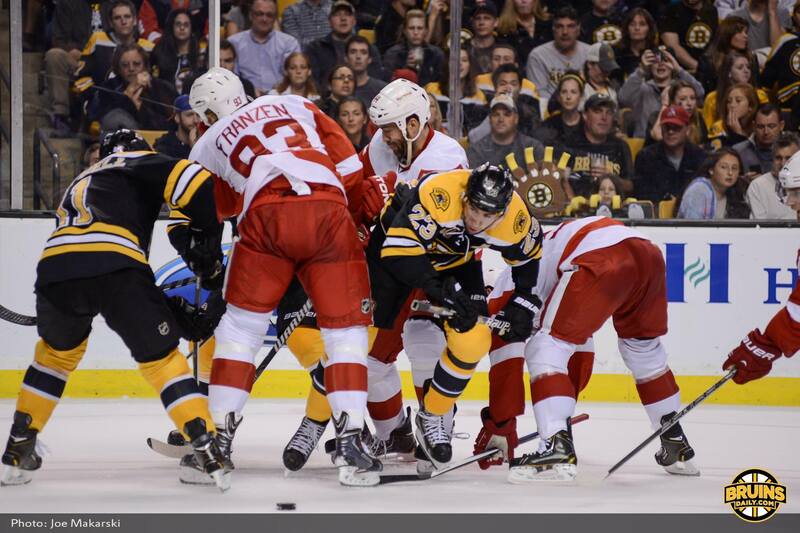 Both the Red Wings and Bruins enter the Stanley Cup Playoffs with solid penalty killing units, it�s the power play where the two teams go in separate directions. The Bruins finished the regular season third in power play percentage, (21.7) while the Red Wings finished 18th (17.7). With Paille out, and Kelly a game time decision, the Bruins could very well be without two of their key penalty killing forwards. The Bruins need to be sharp on the penalty kill, giving the Red Wings some special teams confidence right off the bat in Game 1 could come back to eventually burn the Bruins in the end. Be sure to follow Bruins Daily on Twitter throughout the Stanley Cup Playoffs for all your Bruins news!